Within the next 12 months, the Dow Jones will reach 30.000 pts! That the Dow Jones Industrial Average will reach the next upcoming Big Round 30.000 pts in 12 months is not a tough call anymore after the many extraordinary bullish signals the market has fired in course of the past few weeks! Rather a compelling necessity! The proof of this forecast will be provided in today's issue. Before that, the Dow Jones will be able to achieve new alltime-highs within the next two weeks, but at the latest around Easter. Only to then to continue it`s V-shape rally cycle that started Chrismas lows until May, likely trading at the 27260-27155 area then. Only this resistance environment should be strong enough to end the monthly bull run since Christmas. Around the 27260-27155 points the index should be allowed to mark its spring-top and then we get a summer correction? Today, we are mainly concerned with the effects of the most important initial up impulses that we can measure after the decisive final bear market low of the year 2009. But also with the above chart highlighted dark-green dotted line that begins at the 2009 Bear Market Low and which is the determining guideline for why the Big Round 30000 uptarget work off is now absolutely necessary. You watch it, the rising dark-green dotted line is the 1*1 Angle, which springs directly from the last most important monthly and yearly low. The price at which the current 10-year long bull market started. Since final 2009 Low this 2009 1*1 Bull Market Angle most of the time supported accurately and strongly and keept 10-year bull market textbook wise intact. 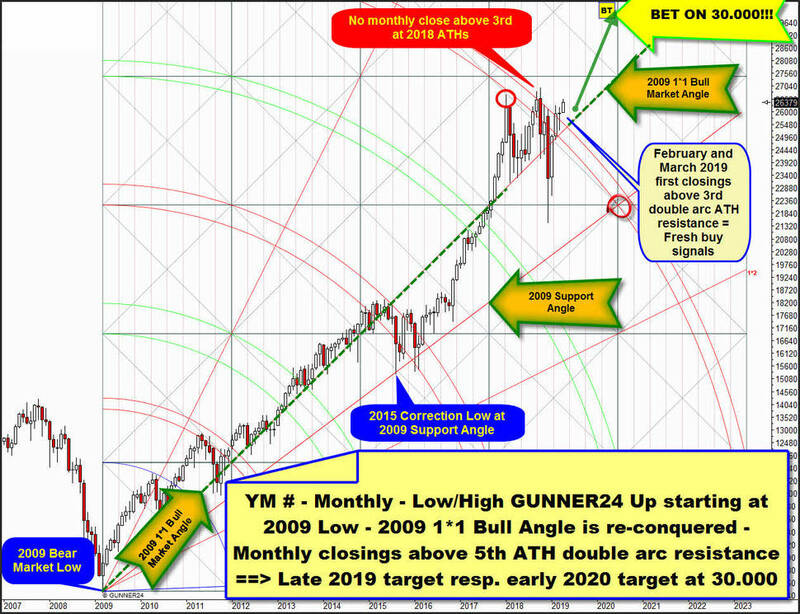 There are innumerable monthly lows and monthly closings to recognize at 2009 1*1 Bull Market Angle which alway is strongest uptrend support as long price trades above 1*1 Angle within a GUNNER24 Up Setup. For the most part of year 2018 and into November low the 2009 1*1 Bull Market Angle was most strongest support on monthly low base, just the December 2018 and January 2019 candles led to the next very deep violation of the most strongest support out of 2009 Bear Market Low. ==> and now that the 2009 1*1 Bull Market Angle is most impressively - again and on multiple monthly closing base - recaptured, he will guide the market further up. Experience shows that the next "deeper" violation of 2009 1*1 Bull Market Angle is likely to be almost ruled out in the coming few months! For this watch A) chart above and B) that December 2018 Spike Low was classic bear trap and always when a bear trap snapped - especially such an important one - market is grilling all the bears with enjoyment for many, many months. Instead, he should have taken his previous state of main support on monthly closing base and monthly low base again! ==> That`s why 2009 1*1 Bull Market Angle again has morphed to most obvious and most strongest Gentleman`s bull-market-long entry-rail until proven otherwise. At the same time! - and this is very important now for the forecast - because of the expression of the launched bull power, coinciding with the recapture of the 2009 1*1 Bull Market Angle support, the final overcoming of the 5th double arc resistance environment took place at final February 2019 and final March 2019 close. You recognize that 5th double arc was strong year 2018 alltime-high resistance area and until February 2019 close no single month close of the 10-year bull market was able to close above the downwards sloping 5th double arc, confirmed, longlasting = stubborn alltime-high (ATH) resistance area. What this means for the near-term and far future into 2020 I would like to explain on the basis of the following chart. It again shows the monthly YM # candlestick chart and again shows exactly the same Low/High GUNNER24 Up setup as anchored above. But with highlights and notes that are groundbreaking! 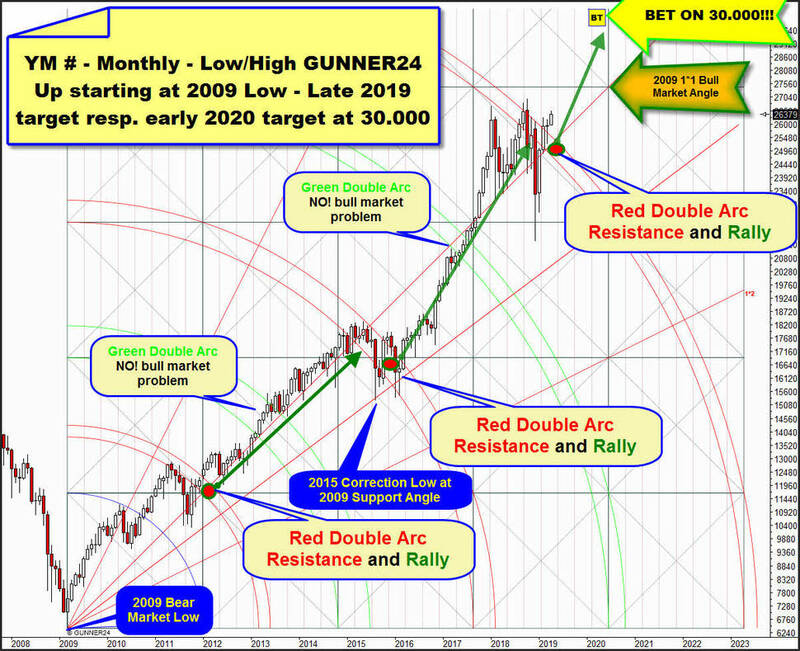 This 10-year bull market found always significant and sustained resistance or important bull market highs at the individual GUNNER24 Double Arcs shown in red. Red = natural resistance, or of course at same time important upward targets within an GUNNER24 Up Setup/uptrend. But once the red double arc main resistance was finally overcome always a sustainable multi-years lasting bull run continuation cycle began in which the light-green GUNNER24 Double Ars offered not any resistance at all and where passed through to the upside like not existant. February 2019 first small close above 5th ATH resistance and March 2019 next month close above 5th and April 2019 follow through is next strong RALLY-SIGNAL because red resistance 5th double arc is now finally overcome on closing base! Means A): VERY likely a next multi-month lasting bull market cycle just has begun! Means B): Market fired usually very sustainable combined buy signal - recapture of 2009 1*1 Bull Market Angle & overcoming 5th double arc - very early in the year, thus with a very high probability year 2019 will be next strong uptrend year with lows made early (January!!!?) and final highs of time frame expected towards the end of the time frame! But before I present the last proof or hint and most important signal why the execution of the Big Round 30000 pts W.D. Gann number - at least! - it is likely to be due by the end of 2019 or at the beginning of 2020, I will focus to the very near future and the need for upcoming higher alltime-highs. 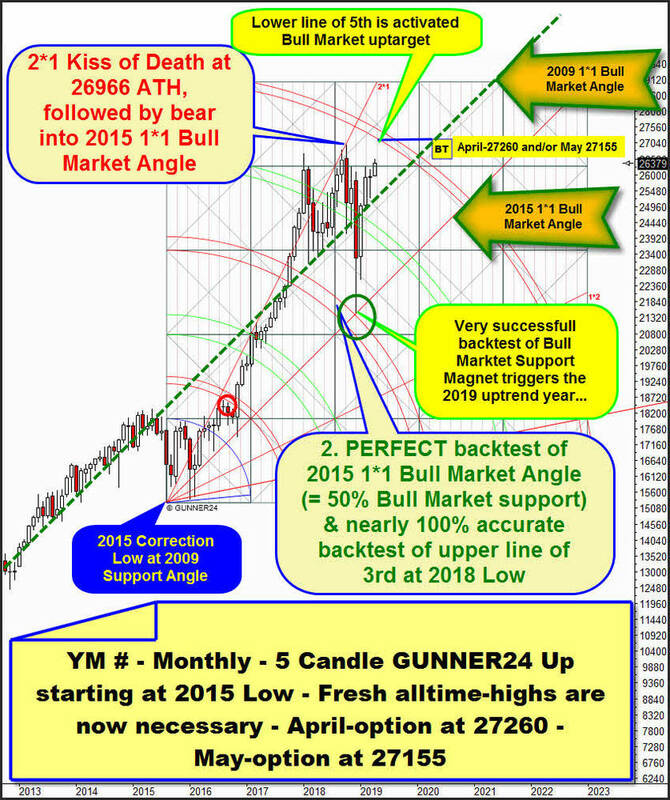 For this we place this classic 5 Candle monthly GUNNER24 Up Setup at the very important final low of the year 2015. The last most important higher bull market low before next higher important December 2018 bull market low. Final 2015 Low, as well as the early consolidation lows of 2016, found natural Gann Angle support, which can be deduced directly from the bear market extreme of the year 2009. I start analysis, current signal state and short-term forecast at current ATH that is at 26966 pts and was last test, negative textbook "Kiss of Death" of 2*1 Angle, that is natural rail out of final low of 2015. Bearish "Kiss of Death" activated test of next lower important Gann Angle which is 1*1 Angle out of 2015 Low. And now observe that this natural downtrend target to the T was worked off from above at 2018 Spike Low. At same time 2018 Xmas low tested back former decisively upwards broken upper line of 3rd double arc from above. ==> We have very successful backtest of 2015 1*1 Bull Market Angle and upper line of 3rd double arc support at same time and at same price. ==> So this 100% backtest of strong bull market supports which originally arise from final 2015 Low have triggered a next monthly uptrend cycle! Please observe that in course of 2018 the 4th double arc uptarget was decisive overcome on monthly closing base. This aggressive 2018 buy signal activated the test of lower line of 5th double arc in trend direction. And well, that very important bull market uptarget magnet is now in striking distance, thus nearest strongest upmagnet on monthly base and I foresee the work off resp. test of lower line of 5th double arc at latest at May 2019 candle! For May 2019 candle prior activated lower line of 5th uptarget is at 27155. IF April will be the month of lower line of 5th execution YM # should reach 27260 pts! Within the next 12 months, the Dow Jones will reach 30.000 pts! Here is why! In my opinion this monthly Low/High up measures the very highest and longest initial up impulse that developed from the 2009 Bear Market low, which somehow makes confirmed sense. So it brings the longest, and thus the most determining bull market waves, cycle, supports and resistances into mathematical context. ==> Setup measures from 2009 Bear Market Low to final high of 2011. Setup among other stuff is confirmed as important because 2nd double arc course determined the very last stronger correction/pullback on monthly and yearly base in course of 2015-2016. 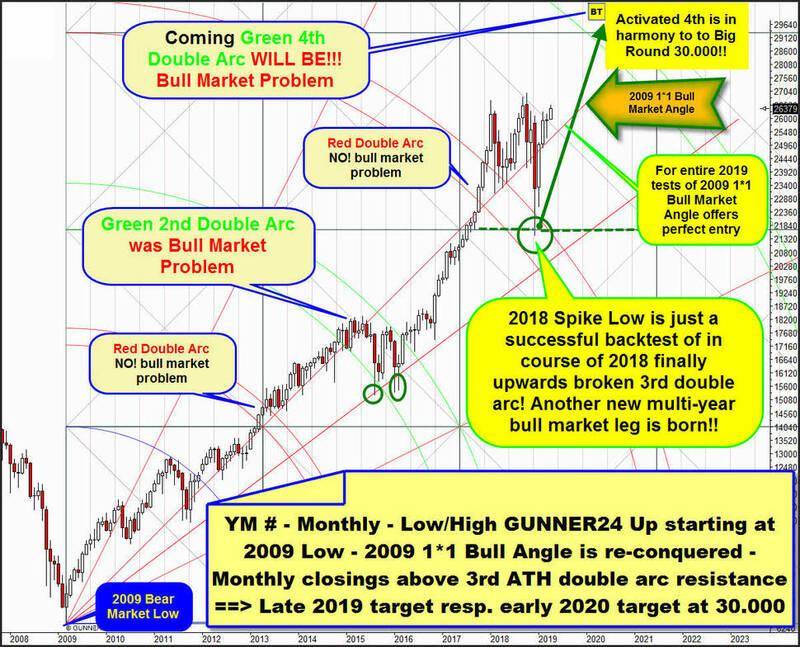 Please recognize that important bull market uptarget of 3rd double arc was finally overcome in course of 2018 and the 2018 spike low just was classic backtest of 3rd double arc from above and this very successful backtest of long-term yearly support with some likelyhood triggered a next multi-year, but for sure multi-month running bull market upcycle. Signal state in the long run cycle is also easy to recognize. ==> Final overcome of 3rd double arc main bull market uptarget on monthly and on yearly closing base activated the lower line of 4th double arc in trend direction as next most important uptarget of the now 10 years old bull market. Lower line of 4th double arc uptarget with a 75% odd will be worked off. 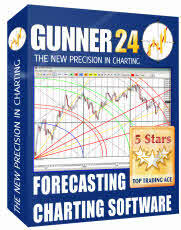 That tells us experience and thus the GUNNER24 Method. Lower line of 4th and the next higher Big Round 30.000 pts form perfect harmonic very attractive = major strong bull market upmagnet towards end of 2019/early 2020! Big Round 30000 pts usually should be worked of within very strong expected year 2019 which usually will be a classic uptrend year with year lows made early, year highs made towards of end of 2019. ==> Long-term forecast, represented by Low/High up setup, above remains strong bullish until uptarget work off of activated 30000 pts uptarget. ==> The more short-term oriented signals on monthly base captured by monthly 5 Candle up starting at 2015 Low have changed to very bullish pointing to an upcoming 27260-27155 pts work off until end of May. ==> The more mid-term oriented outlook on monthly base captured by monthly Low/High up setup starting at 2009 Bear Market Low which I introduced at the beginning signals that a powerful multi-month ev. multi-year rally is on the way and started at December 2018 Spike Low = next important higher bull market low. ==> There is nothing bearish anymore. 2009 1*1 Bull Market Angle should guide YM # into 30.000 pts. 30.000 pts is activated MAJOR uptarget and MAJOR upmagnet and usually has to be worked off sometimes within course of next 12 months!